A fellow guild member bid on some black 4" metal zippers on Ebay and won the bid. When they arrived she realized it was hundreds of black zippers, more than she could use in a lifetime. From this event, a guild challenge was born. We each received at least one zipper and we had to create something using it. 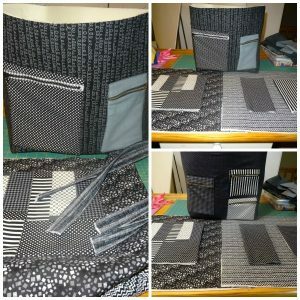 I took four and created a super zippered bag using 10 fat quarters. 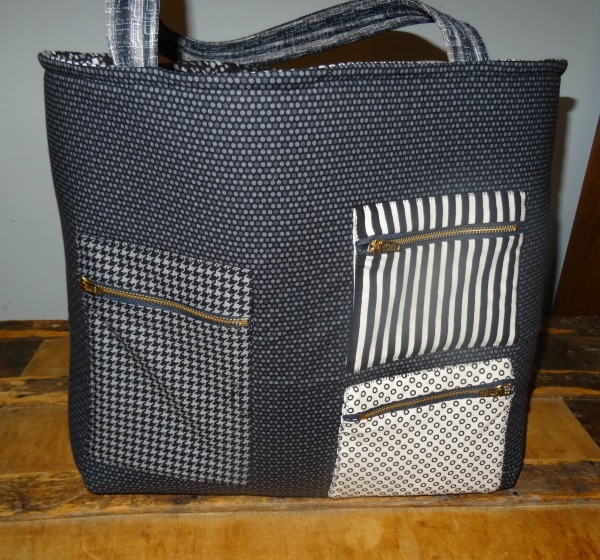 Here is a look at this fabulous zippered bag, all finished. However, it does not allow you to fully experience its full glory. It has zippers on both sides and pockets inside. I bet you want to know how I got to this finished stage. Terrific, because I am eager to tell you. 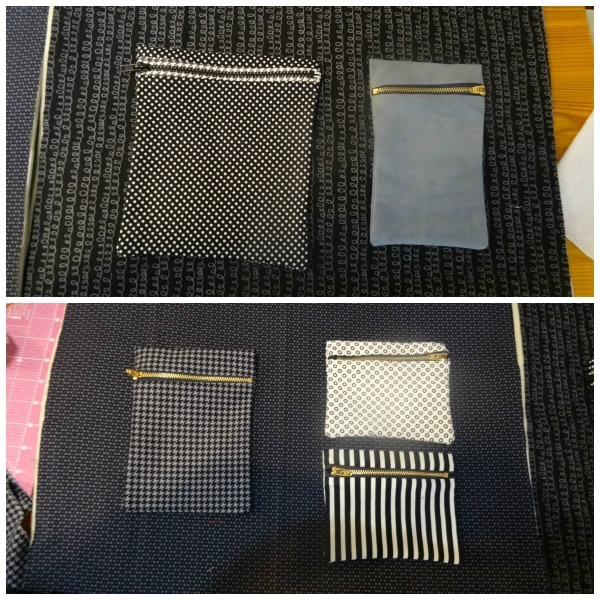 This project began, as many do, with a trip to a fabric store. 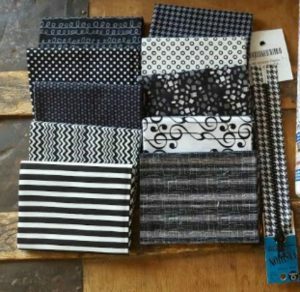 Last April we were on vacation on Orange Beach and we meandered up to Mobile to seek out fabric stores. Well, that is what I was seeking, my husband wanted to see the USS Alabama. At any rate, we went to a store with the friendliest staff in the whole world. I HAD to buy something. First I spied the checked zipper and thought, cool. I bought 10 fat quarters to do something with the zipper. I sewed them onto a trimmed up fat quarter. 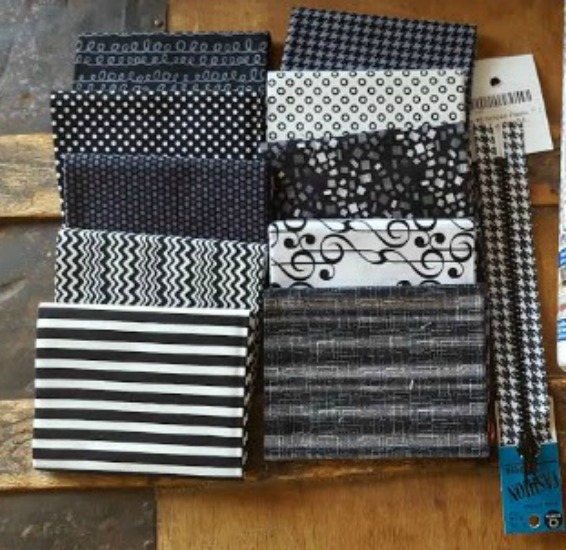 I didn't want to use the music fabric from my black and white collection so I used dark grey. The pouches each used a fat quarter. I sewed soft and stable onto the back of each outside fat quarter before adding the zippered pockets. I used two more fat quarters for the lining and one for the straps. I used every scrap for the inside pockets. 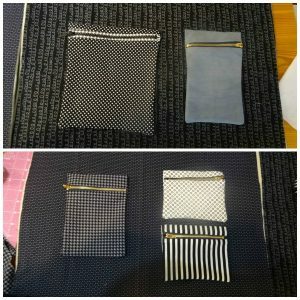 The inside pockets were lined, as are the zippered bags. That took up more fabric, but the end result is worth it. I loved pockets in my bags. Did I use my serger? Of course I did! I serged the sides of the outside back and the lining. Did I line the lining, yes; I used Pellon iron on batting. I left a gap on the lining and then serged the tops together. I was careful to avoid the straps which I had added to the outside section of the bag. I then turned it inside out through the gap and stitched it closed. 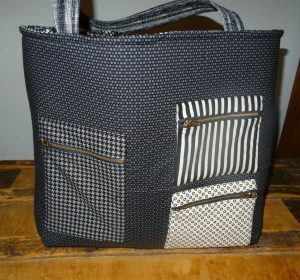 I pressed the bag and added a row of stitching along the top. I like to do this to keep the lining firmly inside. 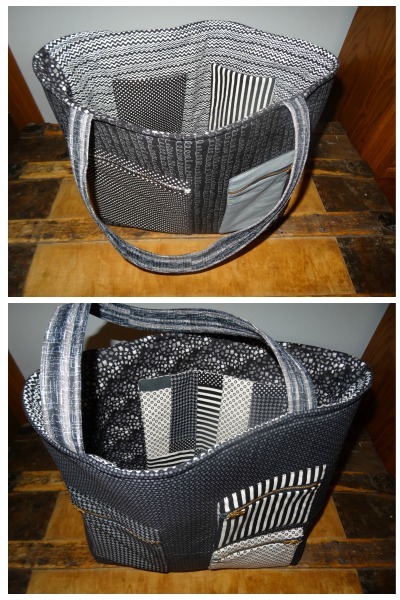 Here is the finished bag with inside views as well as both sides. Great, yes? Need more directions? Check out these posts on bags. I love making them. I'll be zipping along now! If you want to keep reading my blog, you can subscribe. 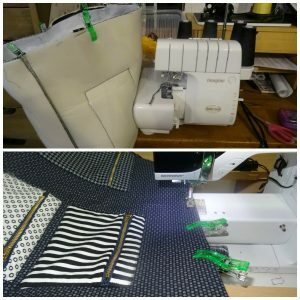 Nervous about sewing zippers? Check out this tutorial.